to select two rivers to paddle–one new river (one which I have never paddled) and one old river (one which I had previously paddled). I chose the Homosassa River in Homosassa, Florida, as my “new” river. The Homosassa River originates at the Homosassa Springs in Citrus County. From there, the river travels about 8 miles westward before emptying into the Gulf. The Homosassa Springs State Wildlife Park sits at the river’s headwaters. I toured the park this past summer and even visited the underwater viewing room to watch the fish and manatee from below. Pretty cool. 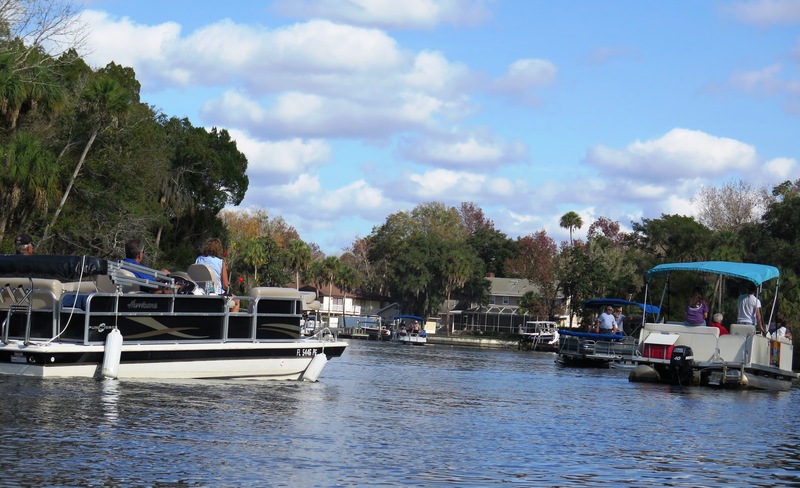 The Homosassa is designated as an Outstanding Florida River, and by Florida Statute, it is “worthy of special protection because of [its] natural attributes” (Florida DEP). From where I put in at Riversport Kayaks, I could see the considerable development along the river with homes and businesses. Small motor boats and pontoon boats filled with sightseers watching for manatees crowded the river heading east towards the springs. The sounds of puttering motors and country music filled the air, and there was no question that this would be a fun, rather than serene, paddle. It was afternoon, and I paddled away under a beautiful, sunny sky with a light breeze—perfect weather for paddling. Kayakers and paddle boarders enjoyed the lazy afternoon keeping to the shoreline. I followed the crowd and paddled toward the springs as well, catching my first whiff of gas fumes just as a manatee ducked beneath the surface in front of me. Outside the protected springs area, snorkelers swam in groups, hoping to make friends with a manatee. I paddled among the boats and then ventured into a couple of the river’s little nooks hoping to glimpse a bit a nature unaffected by all the commotion. I took a detour to the north and paddled under a bridge onto the Halls River, leaving the boats and country music behind on the Homosassa. Halls is a spring-fed tributary of the Homosassa, only about 3.5 miles long. It’s surrounded by tall marshy grasses. I explored a more shaded and narrower branch of the river for a while, and then I headed back to the outfitter—not spending near enough time on this river. Perhaps I will return to this river next year for a paddle to the springs. Sounds like a new year’s rush…fun with manatees and motorboats. Local yacht club I reckon. It was fun! I went back to Withlacoochee as well–two completely different rivers!